At least 30 persons were injured in sporadic violence on the final day of the three-day crippling nationwide general strike called by Bangladesh's main Opposition Awami League to protest a grenade attack on its rally in which a former minister was killed. Islamabad has received positive signals from New Delhi on the proposed trans-Pakistan gas pipeline, a venture that appeared to be going sour because of recent Indian resistance to it. Five suspected Islamist militants were killed in a gunbattle with security forces south of Kuwait city today that also left five policemen injured, state television said. Up to 15 British troops are believed to have died when a military transport plane crashed in Iraq, Britain's Press Association reported, citing military sources. The International police is painstakingly digging up mass graves in Sri Lanka in a bid to identify foreigners killed in the tsunami tragedy and return them to their loved ones. 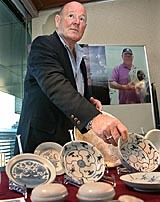 Australian treasure hunter Michael Hatcher displays crockery salvaged from a Chinese ship sunken off Indonesia in the 1800s at the Japan National Press Club in Tokyo on Monday. Red wine is reputedly good for health. Studies now show that fine claret or Beaujolais could soon be the favourite recipe for good skin. According to the Scottish daily Scotsman, wine or wine-related products are the new healthy beauty treatment to fight off ageing. A 10-year-old Palestinian girl was killed by Israeli tank fire while she was inside a United Nations school in a southern Gaza Strip refugee camp, Palestinian and UN officials said today. A fight between inmates at a prison in eastern Pakistan today left six of the prisoners injured before it was brought under control, an official said. The violence, involving about 20 prisoners at the high-security jail in Jhang, was triggered by a dispute over the transfer of two inmates to a different part of the prison. Security was tight across the country and shops and schools remained closed. Most vehicles were also off the roads. `On the final day of the strike, former Bangladeshi President Badruddoza Chowdhury, who was forced to quit office by the ruling party, staged a token hunger strike along with his son Mahi B Chowdhury, MP, and party supporters at the office of his Bikalpadhara Bangladesh political party here. "A government which cannot provide security to the country's people should go," he said while slamming the Begum Zia government for failing to track down the perpetrators of the grenade attack on the Awami Leaque rally. The strike was joined by a group of demonstrating lawyers and war injured veterans of the 1971 Bangladesh war against Pakistan. A taxi driver was killed in southeastern Luxmipur last night when it was attacked by pro-strikers, while sporadic violence into the night was reported. The estimated $4 billion project is meant to transfer gas from Iran to India via Pakistan through a 1600-km pipeline. Indications are that the stalled project may be revived soon. Serious negotiations on the project are expected to take place during the next few weeks between top Pakistani and Indian leadership, it is learnt. It will be a major talking point at a meeting between Prime Minister Shaukat Aziz and his Indian counterpart, Dr Manmohan Singh, on the sidelines of SAARC summit in Dhaka, sources said. Mr Aziz will also discuss the matter with the Iranian leadership when he visits Teheran in February. The project was stalled because of a quid pro quo on the MFN status. Apparently, India had subsequently made any progress on the project conditional upon Pakistan agreeing to buy diesel pumped from Panipat. However, positive signals have been received from New Delhi, particularly Indian Petroleum Minister Mani Shankar Aiyar, who has suggested that India is reviewing its policy of linking the gas pipeline project with MFN status and sale of diesel. 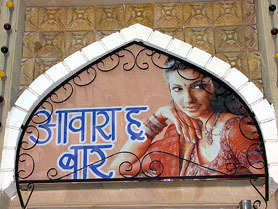 Mr Aziz's maintained that it was a stand-alone project and must be treated as such. On Friday, he reiterated that Pakistan would go ahead with the pipeline project even if India refused or was unable to join the plan. Four other suspects were arrested during the gunbattle in Al-Qurain region about 25 km south of the capital, a day after a gunbattle involving suspected Islamist extremists that left three persons dead and five injured near Kuwait City, the television said. It quoted interior ministry spokesman Adel al-Hashash as saying five policemen were injured. The police had laid siege to a house suspected of sheltering armed men but the suspects refused to give themselves up and an exchange of automatic gunfire erupted. The security forces had been chasing “10 terrorists,” Hashash said. The military sources said the figure was around 10, with it "highly unlikely" to be more than 15, the news agency reported. The Ministry of Defence earlier confirmed that a Royal Air Force C-130 military transport plane crashed north of Baghdad yesterday, but gave no details of any casualties or what caused the crash. Earlier yesterday, British Prime Minister Tony Blair confirmed that troops had died in the crash, but didn't give further details of casualties. The Incident Response Team (ICT), co-ordinated by Mr Rajesh Ranjan, a France-based Interpol officer, operates from a Colombo hotel and has repatriated 17 bodies in the past two weeks. "We are still looking for 38 to 40 other missing foreigners who are believed to be buried somewhere in the country," Mr Ranjan said. According to official data, nearly 120 foreigners died in tsunami that devastated three-quarters of Sri Lanka's coastline killing around 31,000 persons. Red wine is reputedly good for health. Studies now show that fine claret or Beaujolais could soon be the favourite recipe for good skin. According to the Scottish daily Scotsman, wine or wine-related products are the new healthy beauty treatment to fight off ageing. Products such as Red Wine Facial Lotion and Pomegranate Wine Body Polish have already made an entry in the Western market and there are chances wine might get included in more cosmetics and skincare products as the new natural antioxidant ingredient, the report said. Researchers credit the wine's anti-ageing phenomenon to polyphenols and antioxidants naturally present in wine, especially red wine, which promote arterial health and seem to counteract the effects of ageing more effectively than vitamins E and C.
The Palestinian officials said the girl was hit in the head as she was walking inside the school, and that a second girl was wounded in the incident. The Israeli army was investigating the report. A fight between inmates at a prison in eastern Pakistan today left six of the prisoners injured before it was brought under control, an official said. The violence, involving about 20 prisoners at the high-security jail in Jhang, was triggered by a dispute over the transfer of two inmates to a different part of the prison.